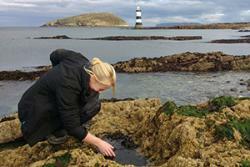 Investigating rock pools at Penmon Point.People with a passion for the UK’s coastline are being invited to help make history by being part of the largest coastal marine citizen science project ever undertaken. Officially launching this week, the aim of the project is to recruit and train more than 3,000 volunteers to help build a more accurate picture of the marine life all around the UK. Collecting data about key indicator species – such as topshells – can provide information about how coastal systems are responding to factors such as increased sea temperatures. The research will help scientists to understand how the marine environment is responding to global climate change and inform future policy and conservation strategies. 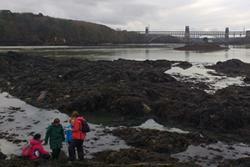 Bangor University's School of Ocean Sciences are part of the national collaborative project, led by Newcastle University and also involving Hull and Portsmouth universities, the Scottish Association for Marine Science, the Marine Biological Association of the UK and the Marine Conservation Society. A Training Day prepares volunteers It also involves a number of organisations including Earthwatch Institute, the Natural History Museum, Northumberland Wildlife Trust, the Centre for Environment, Fisheries and Aquaculture Science (Cefas), the Coastal Partnerships Network and the North West Coastal Forum. 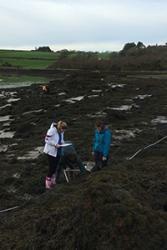 “This is a fantastic opportunity for the public to get involved in ‘hands on’ marine science on rocky shores and at the same time find out more about the research activities of marine scientists in the UK. “This is the first project of its kind and an exciting opportunity for anyone with a fascination for marine life and a desire to make a real impact on our understanding - and ultimately the protection - of our coastal environment. Training and ongoing support will be provided to volunteers by experts in marine science to ensure ongoing interest and high quality data. Capturing our Coast will also be available to those who can’t get out to the shore, with the establishment of web-based citizen science options. Our rocky shoreline provides a wealth of habitats. Multiple research publications directly linked to this project are planned, on topics such as how species assemblages are changing due to climate change. “This is a really exciting opportunity for members of the public to get involved in a project that will enhance our understanding of coastal biodiversity and ecological processes.